Even if the beards and suspenders are ironic these days, the Northwest (and especially Portland) has always been home to that logging camp chic look. As an Oregonian myself, I can attest to the fact that anything with a woodsy, evergreen aesthetic always catches my eye. 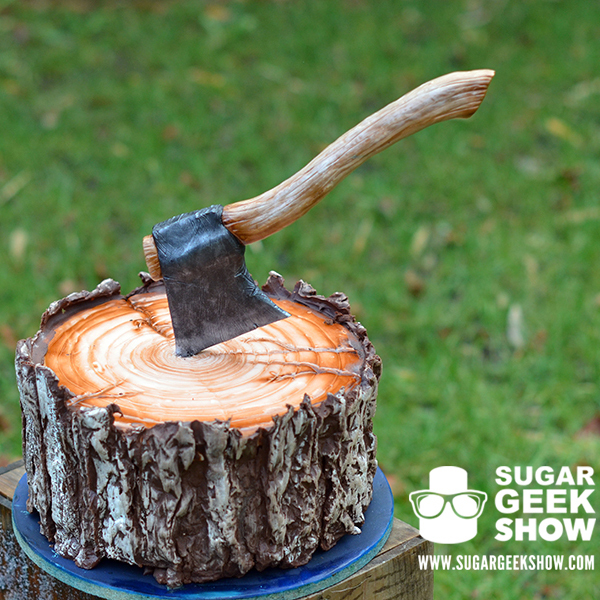 This incredible lumberjack-inspired cake from Sugar Geek Show is no exception. Not only does the outside look like a freshly sawed tree stump, complete with a very realistic axe casually stuck into it, but the baker put in the tedious effort to contract a perfect plaid interior as well. The ultra-realistic details are achieved with airbrushing, modeling chocolate and some serious skill. The artist behind this confectionary masterpiece is Liz Marek, owner of the Portland-based Artisan Cake Company. Marek isn't just delighting locals with her cake creations, she's also started Sugar Geek Show as go-to resource full of decorating tutorials for other baking enthusiasts. Basic membership is free, and provides access to the easy lessons. The Lumberjack cake tutorial is considered a bit more advanced (and judging by the precisely aligned plaid effect alone, for good reason) and can be accessed by paying to become a premium member. If you're ready to up your fondant game, membership could be a great wish list item or the perfect gift to give the budding pastry chef in your life. If this cake is any indication, these tutorials might put you in danger of making treats that actually look too good to eat.